A good camera and media phone, but doesn't stand up against the high-end competition. 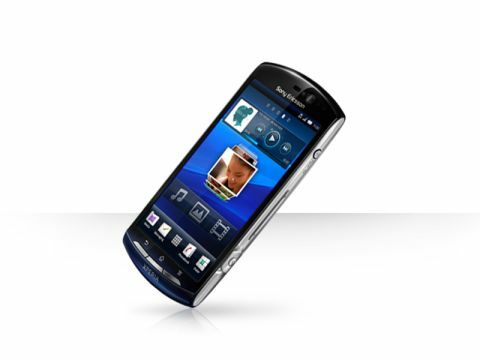 Sitting pretty in the hand, the small Sony Ericsson Xperia Neo smartphone and its 8.1-megapixel camera offer photographic skills far beyond what you'd expect for its 125g weight. The 3.7-inch screen with multi-touch Reality display is nice and sharp, and benefits colour-wise from Mobile Bravia technology. However it fares poorly in direct sunlight, with us having to pull the ol' hand-as-a-sun-blocker move. The phone is small enough to use comfortably with one hand, so it's not a huge problem, but essentially, with smartphones such as the Samsung Galaxy S2 carrying AMOLED and the Apple iPhone 4 with its Retina display technology, should we really be having problems with direct sunlight any more? But, moving on, the (blue for us) semi-anodised finish, curved posterior and well-distributed weighting means it sits nicely in the hand at least. The lock/power key, volume rocker, and – score! – a soft camera key all live on the silver right side of the 13mm-thick chassis. It's not the thinnest of phones, but the depth gives it a nice solid feel in the palm, and it's short enough (4.7 inches, or 116mm) to slip easily into pockets. On the front we have the Home, Menu and Back buttons, plus up top the Xperia Neo squeezes in a front-facing camera, and proximity and light sensors. On the back, of course, we have aforementioned 8.1-megapixel camera and a beast of a flash, with which we may have blinded some unsuspecting band members at gigs. Whoops. Placed at the top are the mini-USB port, 3.5mm audio jack and – in keeping with the high megapixel camera – a mini-HDMI port. All in, we're not faced with yet another black slab of a smartphone, which is good, we suppose. It's neat and ergonomic, but it's not the sexiest design ever and doesn't really push our aesthetics buttons. Coming in SIM-free at around £369, it's a mid-range smartphone that fits a lot into its small frame. Running on Gingerbread 2.3, there's also the 8MP camera, mini-HDMI out should you enjoy seeing your videos on a big screen, and a multi-touch 3.7-inch screen. The Xperia Neo definitely leans on its media offering, but for what it's worth, that's some pretty good stuff, and great if your smartphone is more for play than it is for work.